Why is the MG TF called a "TF"? 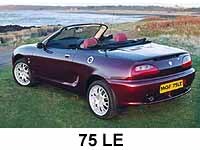 The first all-new MG for 32 years, the MGF was launched to critical acclaim at the 1995 Geneva Motor Show. Initial attention naturally focused upon the mouth-watering technical specifications of this land mark car for MG: the Hydragas suspension, exotic electric assisted power steering, mid-engine configuration and the award winning K-series engine that had been extended to 1.8 litres for this application (which on the VVC version had also acquired an ingenious variable valve timing mechanism). The styling of the car was judged a successful blend of old and new- with design cues harking back to the last of the MGBs, but with a stance that was uncompromisingly modern and forward looking. 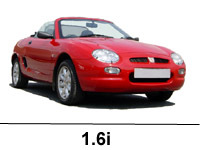 The Original MGF: 1.8i and VVC (1995-1999; VIN 000251-511058). Launched in 1995 as two models- the 1.8i and VVC, which possessed power outputs of 118 bhp and 143 bhp respectively. Standard equipment levels were good for the class of car: remote central & dead locking; passive arming immobiliser and remote activated perimetric and volumetric alarm (earning, in 1997, Thatcham Category 2 security status); electric windows and heated door mirrors. The VVC added further to this standard spec to include electrically assisted power steering (EPAS- which was to become standard on the 1.8i in 1998), ABS and half leather interior trim. Legend has it this car is based upon the tweaks developed by Gerry McGovern for his own Tahiti blue car... 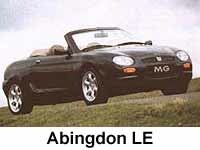 The Abingdon LE (spring, 1998) was the first MGF special, limited-run edition, based upon both the 1.8i and VVC. The car's more luxurious specification included full ('Walnut' beige) leather upholstery, beige soft top and unique paint colour, Brooklands Green (a kind of dark, non-metallic British Racing Green). Other cosmetic extras include an interior and exterior chrome pack- chrome ashtray and lighter, chrome exterior door handles and stainless steel grilles. Also standard, and first seen on this car, were the 6 spoke 'Abingdon style' 16" wheels, fitted with Goodyear F1 (215/40 R16) tyres. 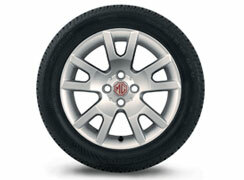 The 16" wheels were soon to be found on the options list for all MGFs and have proven an extremely popular design! 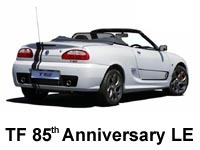 The 75 LE (March, 1999) was launched as a celebration model to commemorate the 75th anniversary of the MG car company (1924-1999). The specification of this model mirrored in many ways the earlier Abingdon LE with unique colours (Mulberry red and solid black) with leather and the fabric hood in a contrasting colour (black on red cars, red on black cars). Chrome interior and exterior highlights were as per Abingdon LE. Interestingly silver was a colour option offered in some markets (but not the UK). 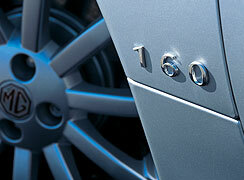 The 75 LE came with Multispoke design 16" wheels, and with either 1.8i or VVC engine options. Mk2 / MY2000 MGF (1999-2002; VIN 511059-535576). 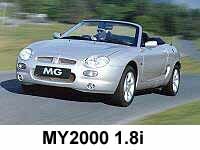 Autumn of 1999 saw the launch of the improved 'Model Year (MY) 2000' MGF models, that are also known amongst MG enthusiasts as the 'Mk2'. The cars incorporated a number of detail improvements aimed at eliminating some of the earlier car's weaknesses, including re-specified EPAS, double skinned petrol tank and detail changes to the cylinder head location and gasket design. Cosmetic and specification changes were few- what there were was aimed at improving the ambience of the cabin- with the only external changes being the painting of the windscreen surround in body colour where previously it was painted black, and the change of colour of the front indicator units from orange to smoked-clear lenses. Thus the cars received new seats designed to improve comfort and lateral support; the door trims now included an alloy insert (or wood as an option), the centre console was redesigned with an alloy theme incorporated (such as the gear lever surround) and improved switch gear. The heater controls were now silver painted. Controversially, the instrument dials lost their 'MG' logos, and the cream faces changed for silver items with a new italic type face. Compensation arrived in the form of an improved six-speaker stereo, with a pair of speakers behind the occupants' heads. VVC models retained their improved specification over 1.8i models. Where the 1.8i received new 8-spoke 'Minilite-style' wheels, the VVC received a new 16" 6-square spoke design. 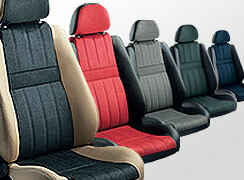 The interior is half leather, and the VVC, unlike the MPi, has ABS fitted as standard. 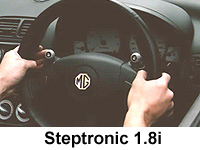 MGF Steptronic (2000-2002). Introduced a little after the MY2000 models, the Steptronic cars received a technically advanced continuously variable automatic transmission (CVT). This autobox includes a 'F1 paddle-shift' gear selection mode, that makes the gearbox operate as a six-speed sequential gear box. The gears can be selected either by the gear lever (push or pull) or the selector buttons on the steering wheel (pictured opposite). Unfortunately, this gearbox is only available with the 1.8i engine, as the gearbox has an input speed limit that is inadequate for the engine speeds that the VVC engine is capable of. Performance figures are broadly lower than the standard manual 1.8i (although it is argued that this car is at least as fast in the real world), whilst trim specs are close to VVC levels. 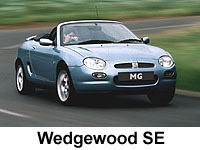 The Wedgwood SE (July, 2000) is the first limited edition based upon the MY2000 MGF. Following the successful formula struck by earlier limited editions, the car comes in a unique-for-MG colour, Wedgwood blue, and its improved standard specification includes leather seats, CD player, chrome interior and exterior accessories and 16" Multispoke wheels. 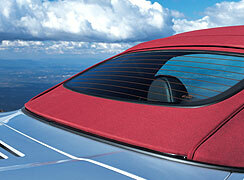 This particular SE also possesses a rear deck spoiler- the first MGF to come so-equipped with it as standard. 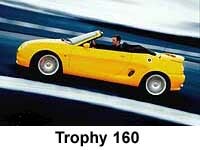 The Trophy 160 (May, 2001)- so named because the re-tuning of the engine resulted in its VVC engine producing 160 PS (158 bhp). Possibly the most exciting and most comprehensively re-worked MGF special edition so far. The mouth watering spec includes lowered and stiffer suspension, AP racing 'MG' branded red coloured 4 pot brake callipers acting on significantly larger front brake discs, a new aerodynamic package consisting of front splitter and rear deck spoiler and that aforementioned engine. Other features include bold new colours- Trophy Yellow and Trophy Blue, a new style of 16" wheels and re-styled front head lamps. The interior has body coloured centre console and door trim inserts, plus coloured high-lights on the seats. Sure to be a classic. 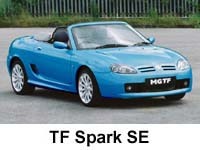 The MGF 1.6i (May, 2001) was launched somewhat quietly at the same time as its bigger, louder brother, the Trophy 160. Designed to compete at the other, cheaper end of the roadster market, the 1.6i competes head on with the similarly sized Mazda MX-5 (Miata). Compared to the 1.8i, the car is de-spec'ed: no central locking, no volumetric alarm, no radio, no power adjustable mirrors, no fancy trim inlays for the doors. The car is meant to be cheap fun. Despite the capacity deficit, the 1.6 K-series is a ballsy rev- happy engine. Such is its effervescent character, one doesn't notice the performance deficit! In other words it succeeds in its aim- it's fun! 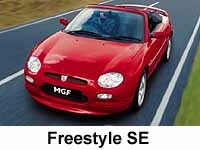 The MGF Freestyle (Autumn, 2001) was the last swan-song of the 'original' MGF before its radically face lifted replacement arrived in February 2002. Equipped with the cosmetic up grades already found on the MGF Trophy 160, the Freestyle thus came fitted with a Trophy-style front bib splitter and rear deck spoiler. The car also rides on 16" wheels, although this time using the familiar 'Multispoke' wheels featured on previous special edition MGFs. The Freestyle does without tuning upgrades found on the Trophy 160 or that car's superlative breaks, and as such is essentially based upon the standard model 1.8i and VVC. And now, the MG TF! 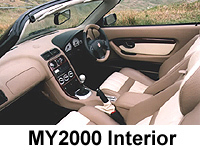 (February, 2002 - April, 2005; VIN 000101-641764) This car represents a dramatic stylistic departure for the MGF and includes a huge number of engineering changes. These include a new suspension system (the car is now sprung by coil-over damper units with a brand new multi-link rear) extensive body strengthening, and a new faster 2.8 turn lock to lock steering rack to name but three. The interior style is practically identical to the earlier MY2000 model, but now offers more colour choice and material options. In many ways, the new TF deserves a new name, although the 'T' prefix has caused some raised eyebrows in MG enthusiast circles. 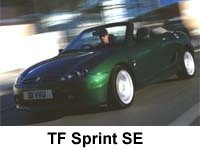 Sprint SE (July, 2002), based upon the TF 135 and 160 variants. The sprint SE had a high specification trim from the outset, consisting of Gunsmoke Alcantara and black leather seats, Smokestone fascia and door panels, a coloured hood, chrome pack and front fog lights. On TF 135 models, Sports Pack 2 (ABS, uprated 304mm front disc brakes and callipers and 16" eleven-spoke alloy wheels  already standard on the TF 160) was specified as standard equipment. Only 600 MG TF Sprint models were said to have been produced in the five colour available combinations: Solar Red, XPower Grey, Starlight Silver, Le Mans Green and Trophy Blue. Cool Blue SE (March, 2003), based upon the TF 115 and 135 variants. The Cool Blue SE is distinguished by its distinctive blue hood and unique Alcantara blue seats. All models feature a Momo leather/alloy gear knob, leather steering wheel, wind stop and ash grey fascia. 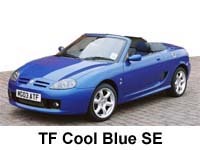 The 'Cool Blue' SE features those staple [and very attractive] six-spoke "Abingdon" 16" alloy wheels, found on so many previous MGF special editions, along with standard fit chrome grille pack and front fog lamps. This SE is available in a choice of three exterior colours: Trophy Blue pearlescent, Starlight Silver or Anthracite metallic. SunStorm LE (October, 2003), based upon the TF 115, 135 and 160 variants. Limited production run of 500. 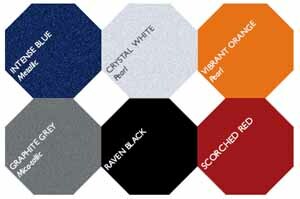 Offered in three body colour options - Raven Black, Nightfire Red and Starlight Silver. The standard-fit body-coloured hardtop is complemented by a Smokestone coloured interior and Gunsmoke Alcantara/ black leather seats, leather steering wheel, 'Momo' leather and alloy gear knob and a single slot CD tuner. The specification includes a black hood, bright pack, 16" 11-spoke alloy wheels and MG/AP Racing disc brakes as part of standard specification sportspack 2, front fog lamps and body coloured electric door mirrors. The Sunstorm SE is available with a choice of engines with three power outputs 115, 135 or 160Ps. 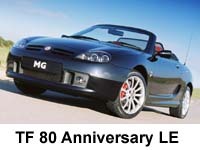 80th Anniversary LE (January, 2004), was launched in celebration of the MG marque's 80th anniversary. There were three exterior colour options: Pearl Black, Starlight Silver and Goodwood Green. All engine and transmission options were available. Interestingly, the silver and black anniversary models were trimmed differently from the green cars, with burgundy red hood, ash grey interior with grenadine Alcantara and black leather seats and bright-finish console, door casings, gear knob and handbrake grip. In contrast, the Goodwood Green Anniversary TF is more traditional in style, combining tan hood with matching tan interior and black Alcantara and tan leather seats. Wood effect inserts are fitted to the console, doors, gear knob and leather steering wheel. 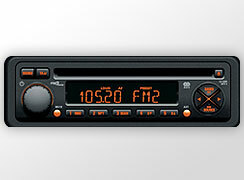 All models feature a folding windstop and CD tuner. 16" 11-spoke alloy ‘shadow chrome finish’ wheels are fitted, along with front fog lamps and bright door handles. Anniversary ‘1924 MG 2004’ logos are found on the boot lid and embroidered on the seats, which distinguishes the 80th Anniversary LE from other LE models. Above: the numbered 'Vintage Racing' plaque mounted between the two seats. 'Vintage Racing' script also echoed below the side air intakes on each side. Clearly designed to evoke the spirit of 1960s motor racing, the car also came fitted with X-Power roll-hoops (the slanting variety), along with 'Vintage Racing' decals below the air intakes and on a numbered plaque below the seats. The specification also included all the usual SE refinements of chrome pack, shadow-chrome 11-spoke alloys and a decent MP3/radio head unit. The seats were black leather, incorporating blue Alcantara inserts, while the centre console was painted in contrasting silver (which was matched to the steering wheel and the door trim inserts). This is a very desirable car - what a shame that an equivalent special edition was not launched in the UK! The suspension too was re-rated with the aim to answer criticisms of the earlier cars that incorporated softer springs, re-rated dampers, thicker anti-roll bars and re-specified bushes. The net result was a significant smoothing of the occasionally bumpy ride that some owners with 16" wheel options (particularly SP1 and SP2 option pack-equipped cars) complained of - without compromising the much-admired handling sharpness. One curiosity of the MY2005 specification sheet was the down-grading of the AP-racing calipers from 4 pots of the Trophy 160/ TF160 to 2 pots. However, I have not yet come across a single MY2005 with the 2-pot AP caliper; perhaps this is due to MG Rover using up existing stocks of the AP-racing 4-pot calipers. 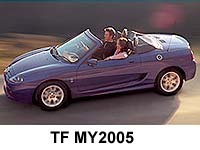 *The MGF register has learnt that a significant number (253) 2005MY TFs were built during the PricewaterhouseCoopers administration period, but the VIN range this applies to, and which market these cars were supplied to are not presently known... enquiries and investigations are on-going. MGTF LE500 (September, 2008). After a long wait, here it is - the new Longbridge-built MG TF - the LE500 - the '500' signifying the number of cars in this series rather than any boast over engine power output! 2009 model year 'standard' TF135 (April, 2009). With the credit crunch threatening the collapse of many iconic international names in motoring (Chrysler at the time of writing having just filed for chapter 1 bankruptcy), these have not been the best of times to re-launch the famous octagon brand into a fragile market. Perhaps this is part of the reason why MG UK have now launched the 'standard' model TF. Devoid of such fripperies such as leather seats and reversing sensors, the new model in the revised MG sports car range come in under the £14,000 price threshold, making this car one of the cheapest roadsters currently available on the market. For those making use of the current scrapage scheme, it could mean that you could be driving home from the showroom having spent under £12,000 - incredible value! 2010 Model Year TF135. These are the end of the line TFs before production was finally wound up at Longbridge in May of 2010. Essentially the same as the MY2009 version, these came with one important revision - the wing mirrors. This investment was made to ensure vehicle homologation compliance for sale in the EU, and are larger than the Rover 200-derived mirrors previously employed on TFs and MY2000 MGFs. 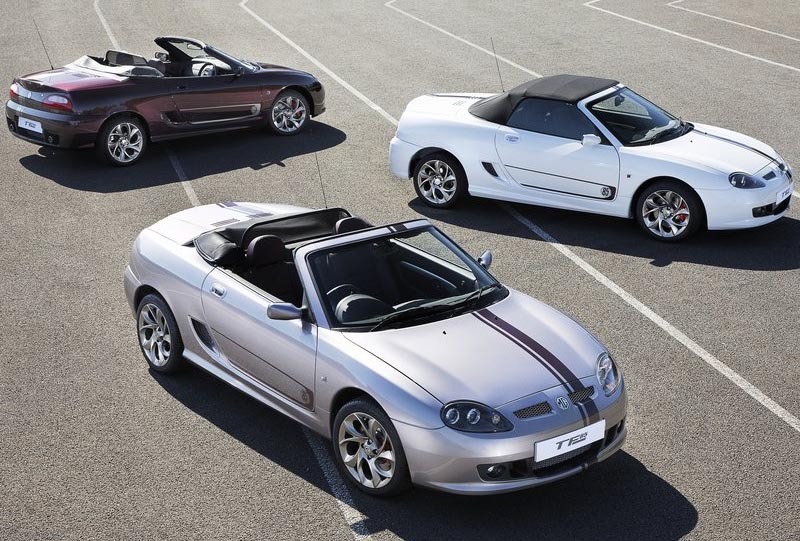 These remain on sale in 2011 as I write this article, so there is still time to bag yourself one of the very last MG roadsters ever manufactured. 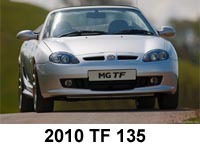 It will be a small bit of automotive history, but the MGF and TF were the salvation of the brand. 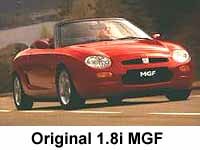 Without the MGF, it is perhaps difficult to imagine that there would still be an MG today. 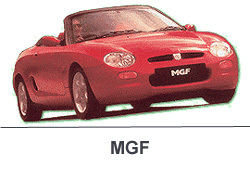 Why is an MGF called an MGF? There are two rival explanations for the genealogy of the name. The first is that the same is simply a marketing ploy, exploiting the positive associations between the letter 'F' and words like 'Fun'. But the name appears to have more logic to it than plucking a random letter and placing it after the hallowed Morris Garages initials. The second explanation therefore, is that the F's name roots the modern MG into the marque's rich naming tradition. 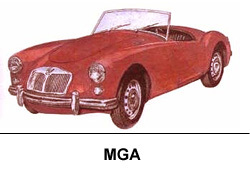 The 'current' naming system commenced with the launch of the first all new MG after the second world war- the MGA of 1955. 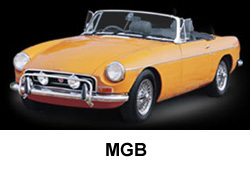 The natural naming progression continued with that car's successor- the incredibly successful MGB, launched in 1963. A six cylinder variant of that car was launched in 1967. 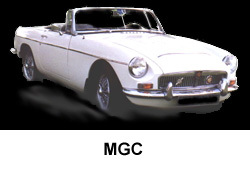 However, the MGC's life was short, being significantly outlived by the 4 cylinder MGB, which eventually ceased production (with the demise of the MG Abingdon plant at the hands of Sir Michael Edwards) in 1980. Behind the scenes however, long before the demise of the MGB, plans were afoot to replace the MGB/C. In the late sixties, the ADO21 project had been spawned. Based upon MGB underpinnings, but using an E-series engine pinched from the Austin Maxi mounted mid-ships, this car was to have been the first mid-engined MG- and probably the first affordable mid-engined sports car. Other elements of the design were dictated by the perceived risk of changes in US safety legislation- which was widely predicted to outlaw soft top convertible cars. Thus a targa design was alighted upon (similar in principle to the Fiat X1/9), with a flying buttress design that masked the height of the relatively tall engine. For better or for worse, that design did not get beyond the drawing board, as it lost out, in internal competition, to a design by Harris Mann for what was to become the Triumph TR7. However, whilst never seeing the light of day, this is the car what is popularly assumed to have acquired the MGD label. 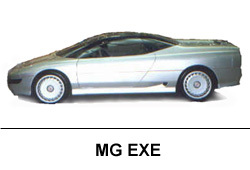 Interestingly, the mid-engine MG concept that was born with the MGD paper concept, was revived some 20 years later in the 1985 MG super car concept, the MG-EXE. Whilst never considered as a true production concept (the politics and image of the MG brand at the time ensured that the EXE stayed a motorshow fancy), the MG-EXE nonetheless was to have a profound influence upon the design direction of subsequent MG sports car concepts. An example of this influence can be seen in the rear lamp cluster design seen on the MGF- which is very reminiscent of those found on the MG-EXE. And so, having used the letters A through to E with either production cars or concepts for potential MGs, we arrive at the letter 'F'. And so it was, in 1995, that we saw the launch of the MGF- a name that surprised the motoring press of the time; the motoring pundits had widely predicted and fully expected the MGD tag for the car. Obviously there are gaps and discrepancies in this naming system. How does one fit in the MGB GT V8? Or the MG revival car, the MG RV8? 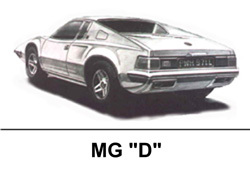 And if one riffles through the 'secret' design proposals for potential MGs, one finds that the MGF tag had already been used- on the MG F-16 (the car that formed the basis for the later PR3 front/ front drive, mid/ rear drive and front/ rear drive development hacks used to evolve and hone the engineering concepts and parameters used in the car that we now know as the MGF). 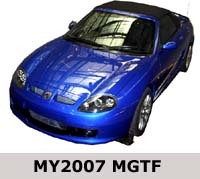 Which means of course, the most likely and plausible explanation for the MGF's name is, perhaps disappointingly, a marketing ploy- but one that at least has a certain logic and one that is based on the heritage of the world famous MG marque. 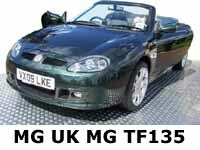 Why is the MG TF called the "TF"? This question is the subject of some debate in MG circles, where the name of a new MG carries more than average interest. As shown in the picture montage below, the TF name has already been used in a family of vehicles- the T-series Midget. This family lineage started before the war with the initial 'TA'. Without development funds being immediately available in the post war period, the design was further evolved with the TD and finally the TF in the early Fifties. 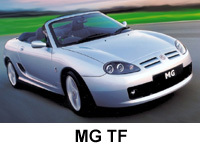 Indeed, as stated in the MGF(TF) release literature, this was the last time that MG concurrently launched a sports car (the T-series) and a sports saloon (the Z-series). The problem for MG enthusiasts is that the new TF bares no relationship with the earlier TF. In fact this is the first time an MG nameplate has been re-used. This may seem silly to some, but many are uncomfortable with this precedent. For me, it causes some confusion in writing this article, ensuring that you, the reader, knows which TF I am talking about! Personally, I feel that it is a little sad that the marketing team couldn't have come up with a better name than "TF". There are plenty of alternatives one could have used, and it seems more logical to continue with the "ABC..F" lineage discussed above. I guess this could be one of those arguments that could be set to run and run... but ultimately, the driving of the car counts more than the minor issue of names! Let the fun continue! A little update to this naming debate - I had a chance to chat to Rob Oldaker about why the MGF was renamed at MGF10. As it turned out, it was a result of a board level discussion. There was a clear eagerness at board level to reflect the extent of the engineering changes that had been implemented for the new car - and the easiest way to achieve this recognition was to give the car a new name. Why TF? Well, according to Rob, because it "sounded right". And so, the MGTF was born.